Many travelers interested in train travel in South Africa will talk about the Blue Train or Rovos Rail. Both are amazing train experiences but they are also quite pricey and out of reach for many. However more affordable options are available but often overlooked. 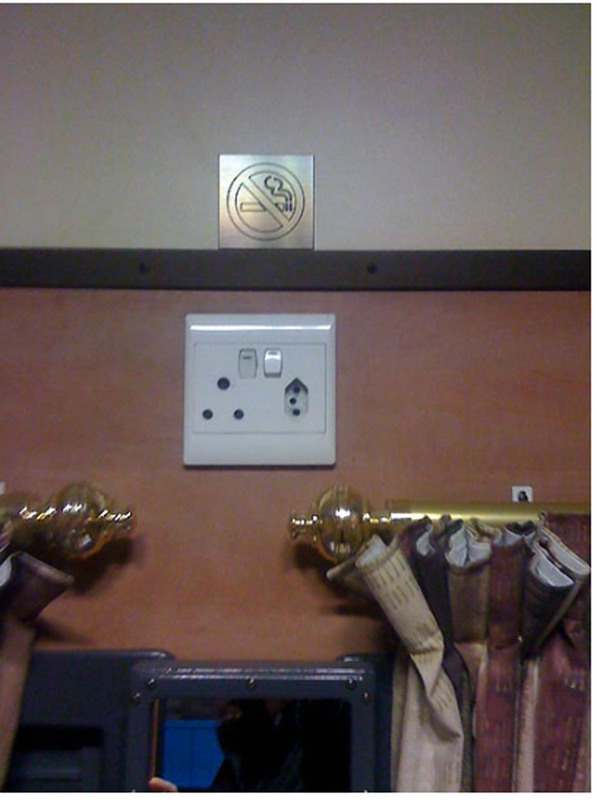 One of these long distance cruise train options is Shosholoza Meyl. It is safe, comfortable, follows scenic routes and most importantly, it is affordable. In fact some of the routes that Shosholoza Meyl travels on are the same routes as that of Rovos Rail and the Blue Train but at a fraction of the cost. For travelers visiting multiple cities in South Africa, train travel cuts out the long airport lines. It allows travelers to get from A to B comfortably while also offering a completely different view of South Africa’s landscape. It’s like a two in one. Move within the country while sight seeing. A great economical alternative to air and bus travel. What does Shosholoza Meyl train offer? The Shosholoza Meyl passenger train travels between many of the major centers of South Africa, namely Johannesburg, Cape Town, Durban, Port Elizabeth and East London. It offers two class fares, a Tourist Class (economy sleeper train) and the Premier Class (deluxe sleeper train). You can even transport your car on the train. Travelers can book the tourist class for travel between the cities of Johannesburg, Cape Town, Durban, Port Elizabeth and East London. You must be willing to rough it just a little on tourist class because there is no air conditioning on the train. However, the windows do open. 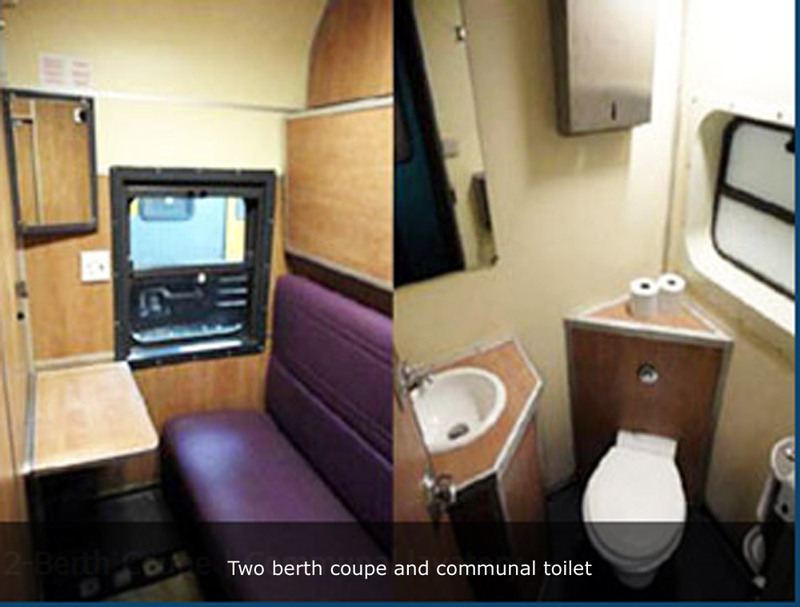 The train’s sleeper coaches offer both 2 berth coupes and 4 berth compartments. The seating in each will convert to bunk beds. A basin with hot and cold water is found under the table in the compartments. 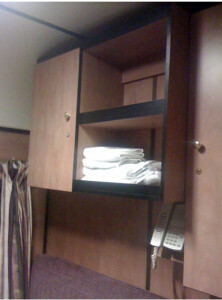 Each sleeper coach offers a communal hot water shower at the end of the corridor. The shower cubicle and changing area does lock for privacy. 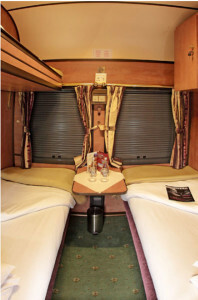 If you are travelling alone you will be booked into a 4 berth compartment and will be sharing your compartment with passengers of the same gender. If this is a problem you could purchase two tickets and book into a 2 berth coupe on your own. If traveling as a couple or with a friend you will be booked into a 2 berth coupe. Families/Groups with 3 or 4 passengers traveling together will be booked into a 4 berth compartment. The toilets are communal and found at the end of the corridor. If you were on a plane or bus you would have the same option so perhaps for many this wouldn’t be a deal breaker. 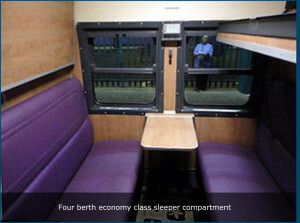 Four berth economy class sleeper compartment. The basin is under the table. Bedding is not included in tourist class but may be purchased from an attendant. Towels and soap is also not included. Meal options are limited on the train, but passengers are permitted to take their own food and drinks on board. The restaurant car offers snacks, beverages and some budget friendly meals. The restaurant accepts cash only. A traveling cart is available during the day to purchase snacks. Email South African Railways for their weekly schedule and route prices. Fares are released every 3 months. You can not book a tourist class ticket more than 90 days prior to departure. Cars are only transported between the cities of Johannesburg to Cape Town and Johannesburg to Durban. The tourist class train will stop at cities between your departure city and destination. This is not a hop on hop off train. If you depart the train early you will need to purchase another ticket to continue onward. Between Johannesburg and Durban at the end of each month. All coaches are air conditioned. Passengers can relax in the lounge car which has a television. The train’s sleeper coaches offer single berth coupes, 2 berth coupes and family compartments. If you are travelling alone you will be booked into a single berth coupe. 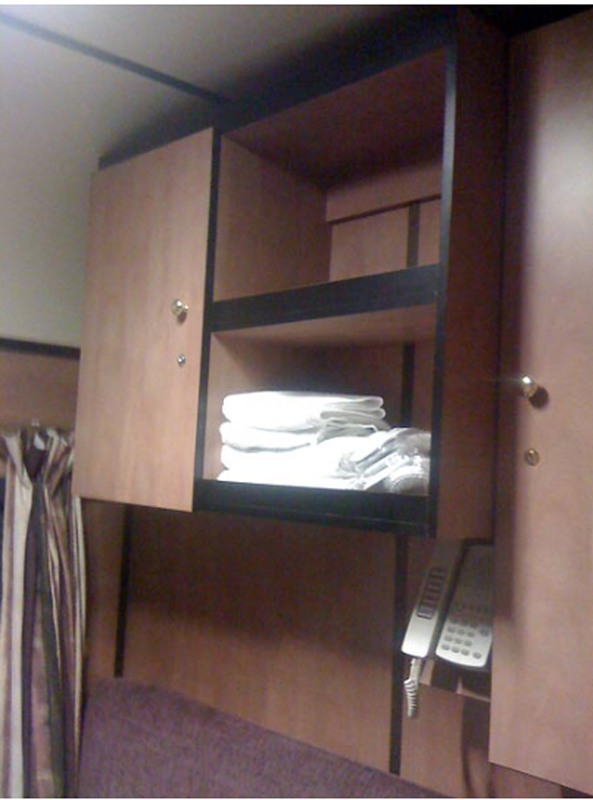 Bedding, towels, bath robe and amenities (toiletries) are included in the fare. All meals – English breakfast, four course lunch, high tea and five course dinner - are included in the fare and served in the dining car. On arrival passengers are treated to welcome drinks and snacks prior to departure. Alcoholic beverages are not included but may be purchased on the train. Additional information to consider for both classes. Passengers who are more than 6 months pregnant will be asked for a Doctor’s letter of approval stating that it is safe to travel. Some seasonal rates affect the cost of a trip, especially between late November and early January. This is peak season. Pets are not allowed on the train. Enquire about service animals. There is a luggage restriction of 25kg (55 pounds) per adult passenger. Excess luggage will carry a fee. The train is non smoking. Sleeper compartment doors lock from the inside. Copyright © 2013 FindTripInfo.com. All Rights Reserved. 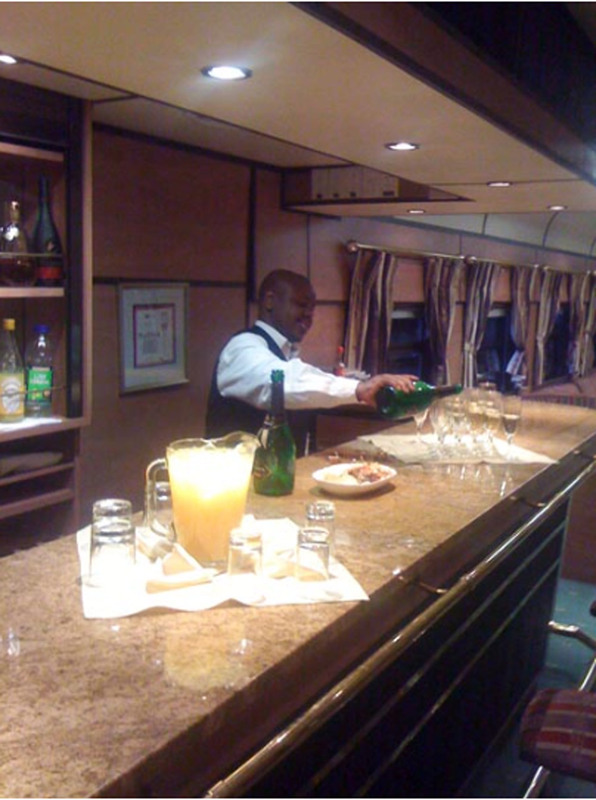 This entry was posted in All about travel, Themed travel, Train travel in Africa, What is it? and tagged African train travel, cruise trains, economy train travel in Africa, premier train, shosholoza meyl, south african train travel by Findtripinfo.com. Bookmark the permalink.